Hello! Red Kite in London! A red Kite flew low over my garden in Herne Hill, South London yesterday. It was flying low and slowly, East - West. Anyone seen one in central London before? We had one over RSPB Rainham Marshes (east London) this morning. Besides resident breeding birds, at this time of year we also get migrating birds on their way to Scandinavia. 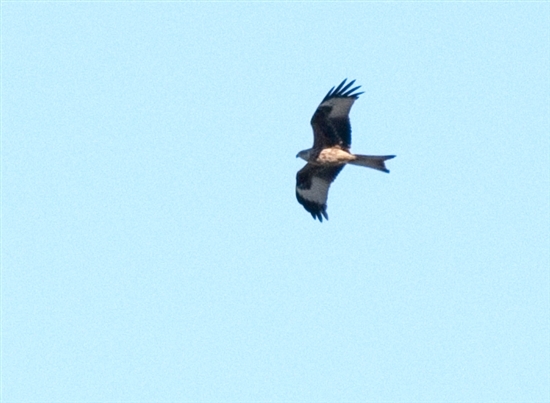 Here is a cropped photo of the Red Kite seen at RSPB Rainham Marshes today that Aiki has told you about. My version. It was just tooooo far away! You may think it too far away Aiki but it shows the underwing pattern brilliantly.Great to hear they are making a return to the streets on our capital.When Chris was taking me to St. James hospital regularly last year we often saw them over the streets of the Harehills area.We sort of gauged the sort of medical day we would have by the number of Kites we saw.Reckon they may scavenge on curries a lot looking at the take away shops in that area. We do not get many success stories with raptors b ut this is a great one.I think it helps that the birds are fairly easy recognisable even to non birders so they take an interest in them too. The weekend's sunchine seems to have brought out a clutch of predators. We had sightings on red kite, buzzard. sparrowhawks and of course peregrines over London. We're still awaiting confirmation of nesting red kites in the Capital, but know they are slowly creeping inwards from the West, south and east (Epping). Do share any future updates. Red Kites can now potentially be seen passing over London, including central London, at any time during the year, but with peaks during March to May and late July to September (mainly during the spring). There are now a few pairs breeding within the London Natural History Society recording area, which is a 20 mile radius centred on St Paul's cathedral. I just saw a Red Kite on the roof of Tower Hamlets College on Poplar High Street, East London. It was massive , I was about 5 feet away. There were a couple of students with me, who were staring open mouthed. I could see that both of its talons had been tagged. What would this mean? If you mean it had straps on its legs (talons are just the claws - four on each foot), that would indicate it is an escaped falconer's bird. Red Kites are not generally kept/used in falconry though. Did you take any pictures? I meant legs. I didn't get a picture unfortunately.The Kite seemed to have thin straps of black plastic on each leg. I read in a post above that there are a few pairs breeding within a 20 mile radius of St Pauls. It might have been one of them? Doesn't explain the straps though.